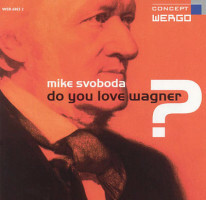 “Do you love Wagner?” Mike SVOBODA: Var comps. Richard WAGNER arr. Mike SVOBODA: Var comps. Scott Roller (vlc, vocals, melodica), Wolfgang Fernow (cbs, vocals, melodica), Michael Kiedaisch (perc, vocals, accordion, e-guit), Mike Svoboda (trb, vocals, megaphone, harmonica). Wergo 6802 2 (1 CD) (http://www.wergo.de/). Given that the mature Wagner’s themes are so deeply saturated, they remain distinctive even when distorted with comic touches via jazz. Wagner can withstand the abuse. Or perhaps it’s affection. In Svoboda’s wide-ranging homage, original bits may be recostumed (an accordion and two melodicas provide the Tristan prelude) or might lurk beneath contemporaneous texts (Satie, Nietzsche) which criticize or worship. Svoboda’s light tenor is slightly creepy. His discomfort in English and German fits this circus. Oliver HERRMANN: Pierrot Lunaire: One Night. One Life. (1999). Dichterliebe: A story of Red and Blue (2000). Christine Schäfer (sop), Natascha Osterkorn (pno), Ensemble Intercontemporain: Sophie Cherrier (fl), Alain Damiens (clar), Florent Boffard (pno), Jeanne-Marie Conquer (vln, vla), Jean-Guihen Queyras (vlc), Pierre Boulez (cond.). 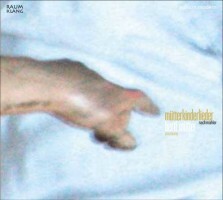 Arthaus Musik 100 331 (1 DVD) (http://arthaus-musik.com/). Schäfer appears in two of her husband’s contrasting films. In a surreal counterpoint to Schoenberg’s thrice-seven settings, Schäfer as a washed-out Pierrot wanders through halls exploring rooms or situations for most every song. The setting is sometimes New York City explicitly, at other times, any impersonal metropolis. Where windows or billboards appear (as in Times Square) we may see Schäfer peering in or out as if through dollhouse windows. I didn’t examine the texts to see whether the meat locker, peep show, supermarket, or roach-infested hotel room aligned. And we see a few moons. Dichterliebe also slinks through a modern setting, mixing a conventional performance with behind-the-scenes action. While Pierrot was consistently surreal, the Schumann presentation shifts between amber shots of Schäfer and Osterkorn performing in a salon (with the scenes outside the windows suggesting a moving train) and a brightly lit apartment as the participants mill about. Sometimes the duo will fumble and restart. Or Schäfer going silent as the music continues. A movie about putting together a movie about performing Dichterliebe is hardly unusual; the shifting focus dilutes Schumann’s arc. “Mütterlkinderlieder.” Gustav MAHLER: Kindertotenlieder (1901-04; arr. Bertl MÜTTER, 2010). Bertl Mütter (trb). Raumklang RK 3009 (1 CD) (http://www.raumklang.de/). A lone trombonist strolls through Mahler’s song cycle adding wide-ranging intermezzos reflecting a deep passion for the music. The transcribed originals remain immediate, even when distilled in Mütter’s effusive storytelling. The Mahler aficionado will find much to puzzle over as the trombonist ransacks the entirety of Mahler’s oeuvre. Mieczysław WEINBERG: The Passenger, Op. 97 (1967-68). Cast includes: Michelle Breedt, Elena Kelessidi, Roberto Saccà, Artur Rucinski. Prague Philharmonic Choir, Wiener Symphoniker, Teodor Currentzis (cond.). Neos 51006 (1 DVD) (http://www.neos-music.com/). On an ocean liner headed towards South America, Lisa, a German diplomat’s wife, sees Martha, a woman she thought had perished at Auschwitz. Lisa confesses to her husband that she was an SS overseer during WWII, and flashbacks interrupt the voyage as we learn of Lisa and Martha’s tangled story. Emotions and tension build despite a bland score. While the plot certainly compels, Weinberg’s music fails to rise above the pedestrian. This release is of the opera’s first staged production. Aulis SALLINEN: The Red Line, Op. 46 (1978). Cast includes: Jorma Hynninen, Päivi Nisula, Aki Alamikkotervo, Hannu Forsberg. Finnish National Opera Orchestra, Finnish National Opera Chorus, Tsuumi Dance Company, Mikko Franck (cond.). Ondine ODV 4008 (1 DVD) (http://www.ondine.net/). Sallinen constructed his libretto from Ilmari Kianto’s book of the same name, the backdrop of which is 1907, the year when Finns had their first election. We follow a poor and illiterate family, for whom suffrage is an irrelevant ideal. Superstitious and distrusting of authority, they require food, safety and protection from a marauding bear. Sallinen’s bold modernity employs folk melodies. Hynninen is superb as the struggling patriarch. This 2008 production, in Finnish, includes a ballet underscoring the action and players’ motives. The DVD includes interviews with Sallinen, Hynninen, director Pekka Milonoff and conductor Franck. John CAGE: Variations V (1965). John Cage, David Tudor, Gordon Mumma (electronics). Two performances: Hamburg, 1966 (video); Paris, 1966 (audio only). mode 258 (1 DVD) (http://www.moderecords.com/). In an ideal presentation, Variations V requires musicians, dancers, lighting and film projection. This 1966 film was made at the NDR studio in Hamburg. 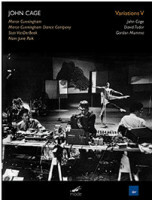 We see Merce Cunningham’s company rehearsing and performing in a television studio with slides and films projected on the walls. There are antennas and photocells fixed to the floor and furniture which react to the dancers’ movements and affect the tapes and other events. The dancers also perform mundane household tasks and ride bicycles. We see spinning reel-to-reel tape decks, and Cage, Tudor and Mumma in their suits, white shirts and narrow ties. The film overlays and cuts between Stan Van Der Beek and Nam June Paik’s visuals and other found images, movie and TV excerpts. It’s a less chaotic document than, say, HPSCHD (which I know only from the EMF CD), and sounds much like the other Variations and Tudor’s Rainforest. Another version recorded in Paris offers audio only. Also included are David Vaughn’s recent interviews with participants Carolyn Brown, Sandra Neels and Gus Solomons Jr.
Jonathan DOVE: The Adventures of Pinocchio (2007). Cast includes: Victoria Simmonds, Jonathan Summers, Mary Plazas, Rebecca Bottone, Graeme Broadbent, Allan Clayton, Mark Wilde, James Laing, Carole Wilson. Orchestra & Chorus of Opera North, David Parry (cond.). Opus Arte OA 1005 D (2 DVDs) (http://www.opusarte.com/). The substantial two-act opera (74:06 + 79:34) begins with a singing piece of wood. To Dove’s genial score Geppetto fashions the mischievous yet naïve wooden puppet. Pinocchio’s adventures, alongside nicely costumed supporting humans and animals, unfold over a quasi-minimal score – a seamless blend of John Adams, Orff and Holst. The numerous diversions permit a variety of set pieces. A puppet show within the opera suggests The Rake’s Progress. Pinocchio’s cure at the hands of the Blue Fairy (with an Owl-, Crow- and Beetle-Doctor in attendance) is strangely enchanting. The wooden boy’s growing nose is cleverly portrayed. His trials include going to jail, becoming a donkey and later a whale’s lunch, etc., until he transforms into a real boy (although a woman takes the role). 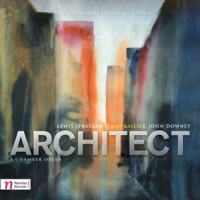 Louis SPRATLAN, John DOWNEY, Jenny KALICK: Architect (2008). Cast includes Julia Fox, Jeffrey Lentz, Richard Lalli. Navona NV5905 (1 CD, 1 DVD) (http://www.navonarecords.com/). Because Louis I. Kahn created such compelling environments yet lived a life of contradictions and secrets, it’s fitting that he provoked an opera about inspiration. Downey and Kalick’s electronic episodes blend with Spratlan’s chamber instruments and three vocal soloists. Kalick also wrote the libretto. The high point is a duet extolling the beauty of concrete as a building material (not to be confused with concrète). The electroacoustic bits combine recordings captured in Kahn’s spaces with further spatial manipulation simulating site-specific acoustics. The DVD features video images (score, parts, recordings of the electroacoustic sections, etc.) that run over the opera’s soundtrack. “The Enchanted Island.” Var comps. (ed. Jeremy SAMS). Cast includes: David Daniels, Danielle de Niese, Joyce DiDonato, Luca Pisaroni, Lisette Oropesa, Layla Claire, Paul Appleby, Elizabeth DeShong, Elliot Madore, Plácido Domingo, Anthony Roth Costanzo. The Metropolitan Opera Orchestra, Chorus, and Ballet, William Christie (cond.). Virgin Classics 4042499 6 (2 DVDs) (http://www.virginclassics.com/). Devised by Jeremy Sams, this pasticcio trawls the Baroque as it touches on the plot of Shakespeare’s Tempest. A fully designed production, this presentation of the January 21, 2012, HD broadcast captures countless charming details including Pisaroni’s Caliban suggesting Uncle Fester, and an over-the-hill Neptune ironically well-played by Domingo. Audiences like countertenors, so here are two, Daniels and Costanzo. De Niese’s offers lively acting as Ariel. Personally, I’d argue that the arias incorporate too much Handel and not enough Rameau, with just the right measure of Vivaldi amid the Purcell, Leclair, Rebel, Campra, et al. With spells and images cast on the scrim, some corresponding modern electronics might have been in order. Perhaps best experienced live as the arias and set pieces afford the entire cast opportunities to shine. I wish we saw more of Christie at work in the pit.